Last year at a Public Inquiry, SAVE Britain’s Heritage & The Victorian Society fought against the redevelopment of Smithfield General Market and won a comprehensive victory when Eric Pickles, Secretary of State, confirmed the Planning Inspector’s verdict and threw out the plans. Bizarrely, English Heritage who are the government’s advisers on – and supposed champions for – historic buildings, took the side of the developer. They maintained that the gutting of Horace’s Jones’s great late nineteenth-century market for the insertion of an office block was acceptable. At one point in the Inquiry, the developers even tried to convince the Inspector that the reuse in the new building of salvaged bits of the distinctive Phoenix columns from the original building which they were demolishing was a ‘sensitive restoration.’ Unsurprisingly, it was an argument that failed to impress the Inspector. Yet, despite that landmark victory at Smithfield and the emphasis it placed upon the importance of protecting Conservation Areas, it appears English Heritage have not taken on board its implications. 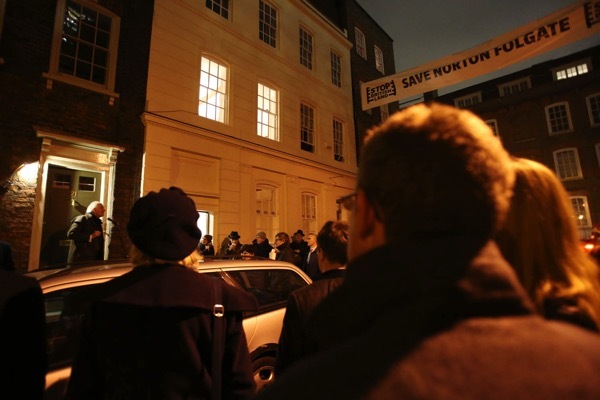 A year later in Norton Folgate, we find ourselves fighting another scheme threatening a Conservation Area in London with English Heritage on the developers’ side. Astonishingly, they have given their approval to the British Land scheme just as they gave their blessing to the Geffrye Museum’s proposal to demolish The Marquis of Lansdowne two years ago. There are many echoes of the Smithfield case in the current battle for Norton Folgate. 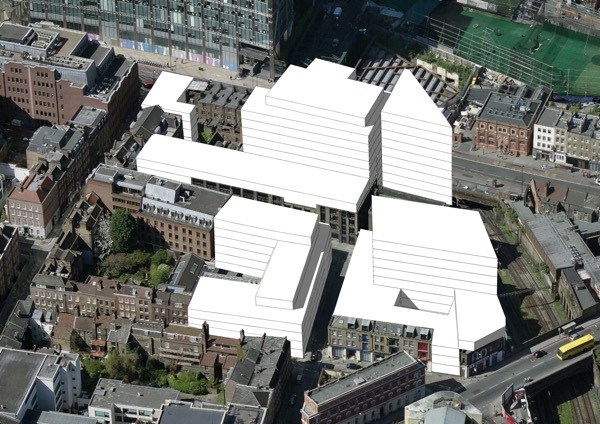 Like Henderson’s scheme at Smithfield, British Land’s proposal involves extensive demolition – in this case over 70% of all the existing fabric. It also involves mutilation of the sound historic buildings upon the site, including the fine warehouses on Blossom St, to allow the creation of large floor plates extending the entire length of the street. These will suit the requirements of the corporate financial industries of the City of London but will be of no use to the small businesses and tech companies that thrive in the East End. At Smithfield Market, Henderson’s proposed keeping only a ‘crust’ of the old building and inserting offices behind it. Similarly, in Norton Folgate, British Land intend to retain a few facades and – just as at Smithfield – they propose, in one new building, to reuse some material salvaged from the old building they want to demolish. This is an approach that – bewilderingly – English Heritage describes as ‘sensitive restoration’ in their letter of advice to Tower Hamlets approving the scheme, which makes you wonder what ‘insensitive restoration’ could look like. 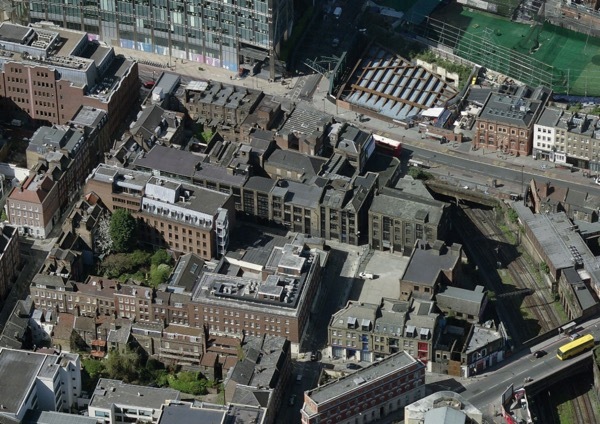 The folly of English Heritage’s position is exposed publicly in a new report by Alec Forshaw, an Independent Planning Consultant who was one of the heroes of the Smithfield victory. A universally-respected former Head of Conservation at Islington Council, Alec Forshaw has the insight and depth of experience to turn a case on its head through his quiet reasoning and brilliant analysis. When the Spitalfields Trust approached Alec Forsaw, he recognised the injustice of British Land’s proposal and agreed to produce his own Appraisal for publication. 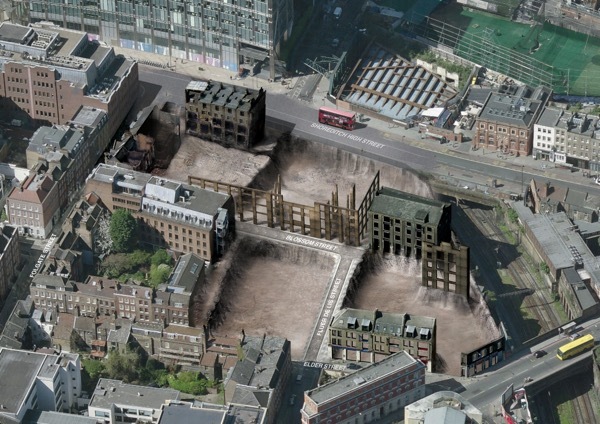 His report examines the Norton Folgate scheme in light of Policy Guidance both nationally and locally, including Tower Hamlets’ own Conservation Area Appraisal. It is a devastating critique, dismantling the scheme point by point and exposing its dire shortcomings. 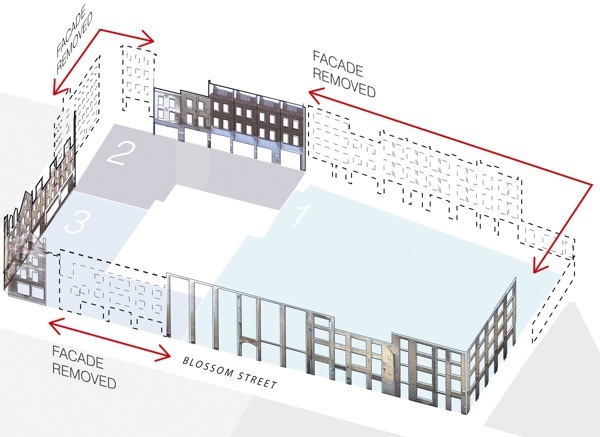 Alec Forshaw’s devastating report demonstrates that the Norton Folgate proposal – like the rejected Smithfield Market scheme – would result in an historic area of London being robbed of its distinctive spirit and sense of place which has evolved over centuries to reach its current atmospheric form. British Land’s proposals ignore the successful genuinely conservation-led revitalisation of neighbouring areas which has been based on principles of repair and reuse. Instead, they set out to exploit the achievements of those who fought in recent decades to preserve the intimacy, complexity and meaning of one of London’s most fascinating and fragile historic enclaves. British Land have no scruple in sacrificing the neighbourhood to make money at the expense of local people. Perhaps ‘English Heritage’ is a misnomer. An online thesaurus lists the following synonyms for ‘heritage’…ancestry, culture, custom, legacy, right, tradition, bequest, birthright, convention, dowry,endowment, estate, fashion, inheritance, lot, patrimony, portion, share, heirship. The antonym for ‘heritage’ is ‘whole’. Thank God for people like Alec Forshaw. Further to my previous comment, some more useful email addresses. I suspect this is an instance of what is called “Regulatory Capture” where the poacher gets a job as a gamekeeper, but still rewards his/her friends outside. See also Gas / Electricity / Water prices …. Glenn is perfectly correct, but until whoever the “moles” are in “English Heritage” are uncovered, there is not a lot to be done, except one thing at a time, like this. Excellent idea @Glenn, I’ll do that too. Here here, thank God for people like Alec Forshaw. We had a problem here with a local family wanting to turn their land, that they had bought over the years, on the edge of an area of outstanding natural beauty, into what amounted to a theme park. As they had also bought a former rectory my son fought to get this recognized by English Heritage as of architectural importance despite them refusing to do so when approached by our local council. The outcome was that, at the very last moment, the rectory was listed Grade II and the planning inspector and Eric Pickles refused the planning application. It can be done, and thankfully, Alec Forshaw is like my son and knows how to do it, someone should get English Heritage to have a rethink, they will do so if approached in the right way with all the facts, there is no point in making an enemy of them, you need them on your side!! English Heritage is a problem as it is a Statutory Consultee too often abrogating responsibility for defending heritage. Local Authority cuts see job losses in planning & conservation depts but EH passes on the job of commenting on applications to the overworked rump still in post. They call that making a response! For them to become heritage clearance agents in cahoots with developers is ominous. The destruction of London’s history is awful. I am totally against this development proposal.